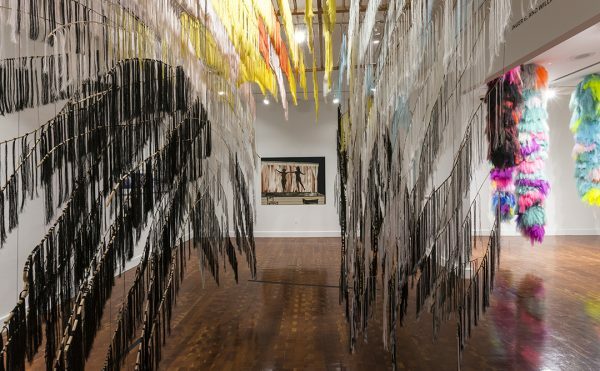 On leaving the recently closed exhibition, Franz Kline: Coal and Steel at Baruch College’s Sidney Mishkin Gallery, I wasn’t thinking of the remarkable range of work on display. 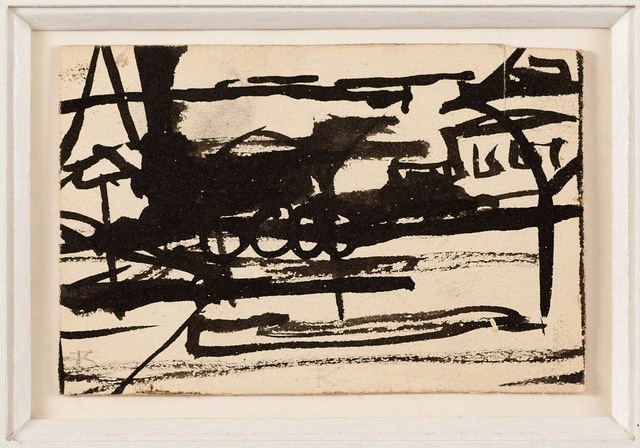 Instead, I kept dwelling on a small ink painting doubly named by Kline “Untitled-Locomotive” (ca. 1945-1947). It was one of a series of very small works with a private warmth that called to mind Van Gogh’s letter sketches. But that wasn’t the only reason why I remembered it. Of all the rare, early-period Kline landscapes, cityscapes, interior studies and sketches in this condensed retrospective, that one small painting made me wonder whether it is possible to see locomotion as such. 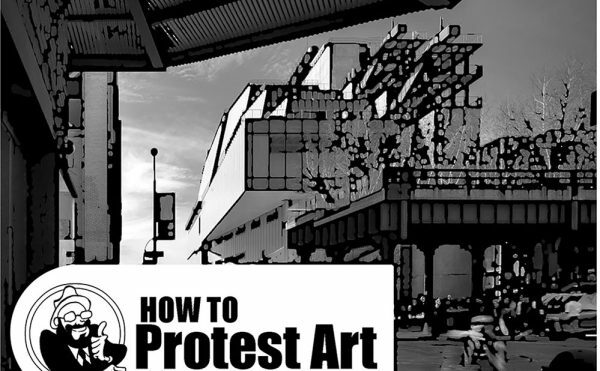 Could painting or even film do justice to mass transit? In 1895, the pioneer filmmakers the Lumière Brothers had asked this question, making brief films that recorded the motion of trains on both sides of the Atlantic. In the decades that followed the Lumières, shooting films set on a moving train became an enduring preoccupation of film directors. In 1945, Kline, who was an avid film buff, was struggling between the stillness of the painted picture and the perpetual motion of modern life exemplified by the locomotive train. 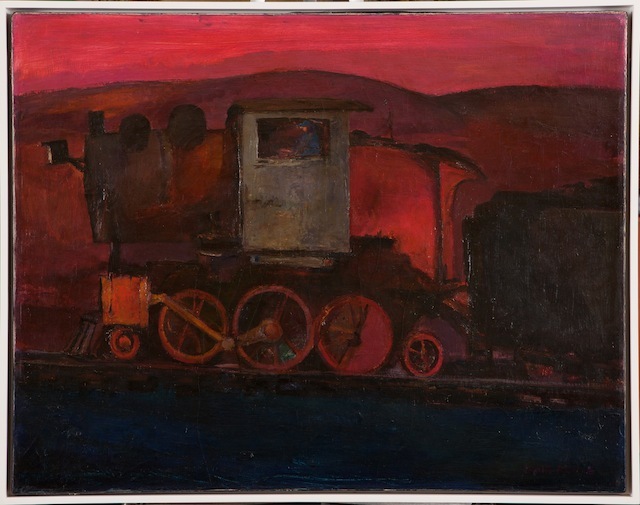 Kline’s small-scale rendition of a moving train draws the viewer into the painter’s challenge as he tries to capture the essence of an object that defies, by its transformational movement,any such representation. In “Untitled-Locomotive,” slashing lines — vertical, horizontal, curved, slanted, circular — proliferate on a small two-ply board, as if the train and its tracks are breaking out of the frame, much like an incoming subway train, as it barrels down the tracks and curves at high speed into a station, transforming itself in scale and location so that it disturbingly fails to cohere as a singular object. It’s a common enough but uncanny experience. At times, standing on a platform as a train rushes in, I instinctively look away, as if some cognitive trigger shuts down my ability to look; I stare down at the platform or upward at nothing in particular until the deafening brakes halt the locomotion and quell the slipstream, and all there is left to see is a huddle of fellow passengers pressing toward the opening doors. It’s as if the motion of an object as big or bigger than the human body so activates our physical defenses that it arrests our visual perception. Despite living in an age accustomed to rates of speed that were previously unimaginable, we are somehow nostalgically or even biologically conditioned to reproduce mostly images of what seems securely anchored or circumscribed right in front of us, controlled by our arbitrary framing. Confronted everywhere with vectors and vehicles, we tend to suspend our creative perception until motion has ceased and we can see the object “at rest” or “as it really is.” When it comes to the visualization of everyday life, we often ignore, or forget, that all around us is process. “Still life,” like the “rising sun,” is an oxymoron. Isn’t a locomotive, by its essence, never a parked train but an onrushing concatenation of headlight, steel, glass, and human bodies? So Kline’s painted lines and angles in “Untitled-Locomotive” are densely interlocked to disclose the object named “train” as indistinguishable from motion itself. The sketch is alive with circular forms (engine wheels? ),a half-arch (the train passing under a trestle?) and an indistinct sequence of squares (the blur of train car windows?). While these notes might risk being pedantic and even academic,I believe they are relevant to the controversies around the confusing critical vocabulary used to describe Kline’s prodigious late career paintings for which he is now famous. These quandaries started as soon as Kline, having abandoned decades of working in realism, first exhibited his black-and-white “abstract” paintings in New York galleries. Reviewing Kline’s first solo show at the Charles Egan Gallery in 1951, the formalist critic and kingmaker Clement Greenberg applied the word “calligraphy” to Kline’s black-on-white brushstrokes, a term that misleadingly suggests the painter developed his method of using house brushes and commercial paint from an impulse to reference or to compete with the art of lettering or Japanese orthography. The term “calligraphy” has been so enduring that it showed up, sixty years later, in Baruch’s Mishkin Gallery show. The category “Action Painting,” coined by art critic Harold Rosenberg in 1951, is more fitting as a descriptor for the turnabout that Kline’s art took after World War II. “Untitled-Locomotive,” along with other such small ink drawings in the exhibition as “Elizabeth at the Window” and “Seated Woman,”changed everything. The sketches can even be said to have altered the course of American art, for Kline’s influence has been found in the later works of Robert Motherwell and Clyfford Still, and in his former student Cy Twombly, as well as various schools and figures since. According to most biographies, Kline’s conversion from a workmanlike, gloomy realist to a leading figure in lyrical non-figurative expressionism began the day that his close friend, the painter Willem de Kooning, helped Kline enlarge such small drawings as “Untitled-Locomotive” using de Kooning’s Bell-Opticon projector. Encouraged by de Kooning, who, like other New York painters, had begun to experiment with removing color from his paintings in the late 1940s, and by the undulant intensities of brushwork, lines, angles and tones made visible by these scaled-up projections of his small black-and-white works, Kline went on, throughout the 1950s, to produce consistently accomplished, large, non-figurative black-and-white paintings that won over critics like Greenberg and Rosenberg and landed him in the top tier of the New York School. Even his buddy Willem might have found Franz’s new method of heavy brushwork to be a useful example, for despite its bold coloration, “Ruth’s Zowie” (1958) has interesting technical parallels with Kline’s painting “Untitled” (1957). The cash registers have been ringing ever since. According to Bloomberg News, Kline’s “Untitled,” estimated between 20 and 30 million, was sold last year by Christies for $40.3 million. And, wow, how Kline could have used that dough. Born into a poor family in Wilkes-Barre, Pennsylvania, Kline was educated in a school for fatherless boys — his father having committed suicide in 1917 — and went on to study painting in Boston and then in London.He returned to the States after marrying, made “jazz murals” and found employment as a graphic artist for the WPA during the Depression, settling in downtown New York City in 1939, quite down on his luck. His English wife, the dancer Elizabeth Murray, was in and out of mental hospitals for most of their marriage. Despite being evicted from various studios and apartments, Kline labored on vital realistic paintings with modernist elaborations, the kind of work that made up the bulk of the Mishkin Gallery show. 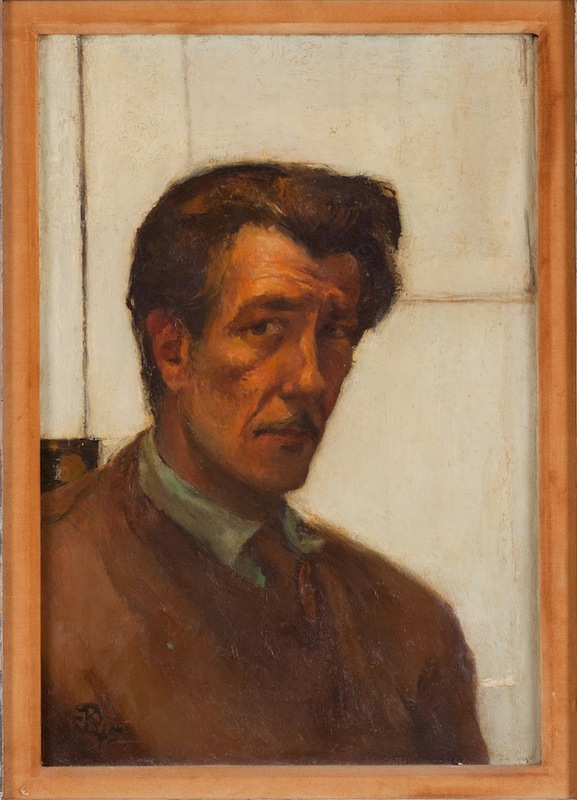 That show’s curator, Dr. Robert S. Mattison, art professor at Lafayette College, seems to posit that while the postwar shift in Kline’s art was abrupt and drastic, his familial roots in eastern Pennsylvania left an indelible mark on his creative consciousness, even, it would seem, in the later black-and-whites. The influence of place is unmistakable in most of the art shown at Baruch. Railroad lines, new roads and iron trestles, blast furnaces, smokestacks, rail stations and coal pits are all represented in his paintings. But the relationship between painter and subject was far more complicated than the show’s narrow theme suggests. Based on the unstable moods of these early works, it seems as if Kline was as captivated by mid-century industrial American life as he was estranged from it. Although the steel, coal, and railroad industries are above all activities of commercial dynamism and brazen excavation of the earth, his early paintings around these features tend depict them as stationary and even stultifying. An opulent despondency permeates the pictures, even in the handsome self-portrait with its slightly self-deprecating nobility and aloof stare, a countenance familiar to anyone who has seen the numerous photos of the mustachioed Kline during his halcyon years of hard work and hard drinking in the Abstract Expressionist heyday of the 1950s. Two large paintings, one in red, “Chief” (1942) and another in blue, are heavily painted close-ups of coal-transporting trains. Kline depicts them as squat monsters, rendered with an amusing, child-like bluntness. His outdoor scenes depicting the life around him in New York City, in contrast, evoke melancholia. A Braque-like rendition called “Chatham Square” (1943) suggests the narrow confinement of the city. “Chinatown” (1941) applies Bonnard-like mottling to a boxed-in and deliberately off-kilter street scene. The modest and literal”Greenwich Village” (1943) is overlaid with a monotonous gloom while “Ninth Avenue Elevated Railroad at Christopher Street” (1940-41) applies post-Impressionistic eruptions of color to the downtown tableau, depicting the proletarian grind of New York City during the early war years. In his unsentimental treatment of streets, figures and buildings, the city is at once charming and deadening. In the end, the Mishkin exhibition had far too few of Kline’s late black-and-whites to fully prove or disprove the representational motif suggested by “Coal and Steel.” And ultimately, it doesn’t much matter what objects inspired those massive later works. Despite Kline’s misleading habit of naming the black-and-whites with literalisms (“West Brand,” “Lehigh V Span,” “August Day,” etc. ), the energy and effects of even the few later works on view in the Baruch show are so extraordinary that coal and steel and American history itself vanishes in their fresh, consistently rhythmic and meditative gestures. The gloom of the earlier realistic paintings is gone. To the extent that they represent an object outside themselves, Kline’s black-and-whites grasp the kinetic nature of things and the partial, incomplete nature of seeing. These paintings allude to parts of a whole, focusing on an indiscriminate component of a random structure, whose proportions are amplified by the black lines and enriched by the textured white ground. The brushstrokes, in their mutating blackness, seem to be moving. The lines they create point to realities outside the frame of the painting. These heavy lines are locomotives in the truest sense. The black contours oscillate, vibrate and harmonize according to a logic that only seems to emerge from the viewer’s stimulated attention to the pattern. Maybe coal, maybe steel. Maybe tire tracks or large oil stains. Maybe the stairwells or awnings of an abandoned factory building. The black-and-whites allow us, now and then, to guess at what might be represented without such glimmers lasting very long. When studying “Painting #2” (1954), if we recognize an object, that recognition never effaces the architectural integrity of the picture, a truthfulness built into its non-referential cogency by the restrained force of how Kline painted it. Whatever object we hypothesize the painting to be, that object is inferred from an activity integral to the thing’s identity: the supportive lower rungs on a rocking chair in “Painting #2”; the downward-facing trajectory of an air shaft the fricative hoisting by a pulley or cable;or the engineer’s spherical profile within the square frame of a construction site’s crane. Even the city’s controlled chaos has a balletic energy that Kline seems to capture. Looking at his black-and-whites, I think of the spur-of-the-moment intersections that coalesce during city strolls. The paintings often seem a rendition, in a more real, aesthetic sense, of the city’s grid, and quite far from abstract.These thick patterns of motion are truer to how that urban layout is experienced by the living body than, say, the tapered and distant mathematical beauty of Piet Mondrian’s “Broadway Boogie Woogie” (1943). In studying Kline’s black-and-whites, the images force us to recognize — to literally see — how our eyes, ahead of our thoughts, constantly orient our bodies in relation to space, and how peculiar or miraculous this fact is. Our eyes aim east when we walk west and so we pivot and correct course without having to think about it. 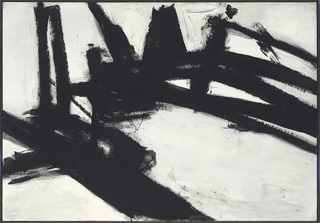 The trajectory of a Kline painting often feels like those split-second reversals when a pedestrian emerges from an underground subway station, guided forward by a mental compass that comes from looking upward at a building, across the street at a parked truck, around at a sudden street sign, and behind at a storefront’s signage. So in Kline’s late work, the viewer’s eyes work both strenuously and pleasurably.Industrial components and urban escarpments are always there, too, in the spare hints of beams, abutments and corners. Manhattan, after all, was in the midst of a building boom throughout the 1950s and early 60s as Kline made his black-and-whites. Franz Kline: Coal and Steel was on view at Baruch College’s Sidney Mishkin Gallery (135 East 22nd Street, Gramercy, Manhattan) from February 8 to March 5. Anfam, David. 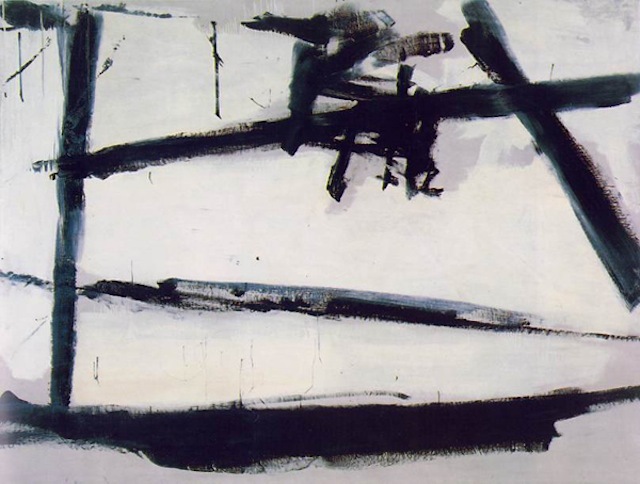 “Franz Kline” Grove Encyclopedia of American Art. (Oxford University Press, 2011). De Kooning, Elaine. The Spirit of Abstract Expressionism. (New York: George Braziller, 1994). Greenberg, Clement. Art and Culture: Critical Essays (Beacon Press, 1977). O’Hara, Frank. Art Chronicles 1954-66. (New York: George Braziller, 1975). Perl, Jed. New Art City: Manhattan at Mid-Century (New York: Knopf, 2005).